Located in the north of the island, Rhodes Town has two distinct faces. 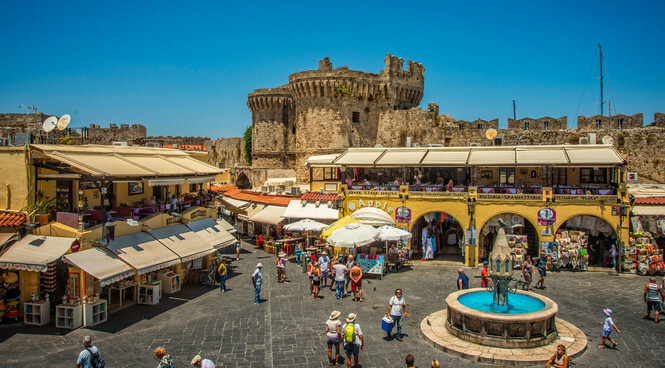 This magnificent medieval town is the cultural hub of Rhodes, with its cobbled alleyways and historic touches wherever you look. You’re best exploring this captivating place on floor, exploring the delights within the walls. By contrast, the new town is a bustling haven of shops with bars and restaurants on every corner where you can enjoy a quick pick me up or relaxing meal. Rhodes Town is also a great location for windsurfers, thanks to the Aegean breeze making waves. Local Markets and Shopping Rhodes Town is the busiest district on the island, and is the perfect place for a shopping spree. You’ll find designer labels along with well-known global brands lining the high street. In the heart of the old town, some of the shops have been around for centuries specialising in pottery, carpets and leather. It’s a colourful scene and fun just to browse and soak up the atmosphere. Every Wednesday and Saturday morning, the largest outdoor market sellers set up their stalls. Located at Taxiarxhis, you can certainly pick up a bargain, including fresh fruit and vegetables, fish, flowers and clothing. Along the east and west coastal roads, there are plenty of large supermarkets to choose from. Bars and Restaurants A handful of cafes, bars and restaurants line the east coastal road of Rhodes, you can choose a fish taverna on the seafront or a simple meze.There are a couple of tavernas in the village of Koskinou, around 5 miles from Rhodes Town that are very popular with the locals. If you are looking for more lively nightlife, then try Ofanidou Street, the renowned bar street in Rhodes New Town, or the open-air bars and clubs in the old town. There are plenty of choices for all ages and budgets from exclusive restaurants, night clubs, discos…the list is endless. Beaches The beaches on the eastern side of the city are perfect for families, with calm, crystal clear waters. Kalami is one of the sandy beaches in the Kallithea area, which has a trendy beachside restaurant with luxury 4 poster beds to rent. 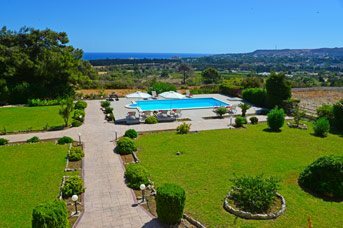 Kallithea Bay is just a short drive along the coast famously known as Kallithea Springs – great for scuba diving and snorkelling with a cafe bar open till late. Neighbouring resorts on the western side of Rhodes Town offer a number of pebbly beaches and are best known for wind surfing, sailing, and paragliding. Elli beach, described by Lawrence Durrell as the finest shingle beach in the Med, is the main beach in the city and easily recognised with the diving board in the sea. There is also a cosmopolitan beach bar, and everything you need to relax and have fun. Family Fun Rodini Park was built by the Romans and is said to be one of the oldest parks in the world. With an abundance of trees creating natural shade, as well as various streams and ponds, it’s the perfect place for exploring or relaxing with a picnic. Alternatively, there’s the Rhodes Aquarium, where you’ll love getting up close and personal with a variety of marine life, reefs, sea flowers, octopuses and different fish. Or there are regular daily excursions from Mandraki Harbour, offering both short trips around the harbour and island hops to the nearby islands of Symi and Chalki. Why not hop on and off the red double decker bus and get a good idea of the lay of the land? Alternatively, just a short drive along the coastal road of Kallithea, you’ll find the largest waterpark in Europe, a magic castle and the Luna Park. Places of Interest The town of Rhodes (Rodos) was once famous for the Colossus of Rhodes, one of the Seven Wonders of the World which has been lost in time. Today, the Old Town is a UNESCO World Heritage site. Take a trip to Monte Smith, the highest point in Rhodes Town, with panoramic views of Rhodes Town, the Aegean Sea and nearby islands. You can also see relics of an ancient Greek civilisation including a theatre, stadium and temple dedicated to Apollo. Visit Ancient Kamiros for archaeology and history - one of the three ancient cities of the island (Ialyssos, Lindos and Kamiros). Alternatively, there’s Petaloudes - the Valley of the Butterflies – where you can take the butterfly train up to the monastery and then enjoy walking back down the shaded valley - a natural habitat to thousands of butterflies. Kallithea Springs became popular in the early 20th century due to its therapeutic thermal springs. With beautiful gardens and steep rocky creeks that offer diving adventures, its one place not to be missed. Lindos and its Ancient Acropolis are also within each reach by car, just 28 miles away. Or, you can sail to Lindos from Mandraki Harbour, with enough time to walk up to the Acropolis, have some lunch and a swim before sailing back along the East Coast.